Perfect weather and photographer clouds. Now this is how you start a day on vacation. We didn't get an early start, but we were on the road before 9:00. 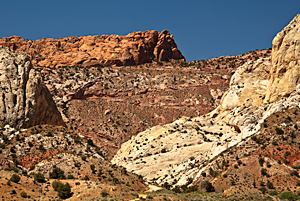 The idea was to get to Strike Overlook in Upper Muley Twist Canyon while the light was still good. That definitely didn't happen. There were too many places to stop and photograph along the way. Even though we've seen the Waterpocket Fold several times, it still amazes me. It looks like one inpenetrable barrier that goes for 50 miles. The lighting was pretty good, and we found a couple places where the anticline layers were nearly vertical along the valley we were following. We even found wildflowers at one stop. I found Sego lilies, and Carol found agave and Phacelia. The lighting was poor, but it was a great stop to walk around and explore. We finally reached the Burr Trail section that crosses the Waterpocket Fold. From the junction with the main road, you would never imagine that a road could cross the ridge there. Only because we have been there before were we able to see the road's path. Although it can be a 4-wheel drive road, this year the road was the smoothest ever. The grader was parked near the top and had obviously been working on the road over the past few days. 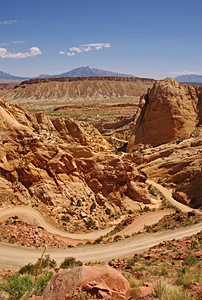 The trek from Upper Muley Twist to Boulder was a long drive across the top of the plateau. The only real interruption was Long Canyon, which is quite striking. The canyon floor is covered with cottonwoods, which paint a rich green framing the stream. We enjoyed our lunch in Long Canyon and then continued on to Boulder. The last five miles into Boulder crosses white slickrock. On three sides of you are these huge cliffs of white sandstone. They were some serious sand dunes "back in the day." We crossed over Boulder Mountain, watching especially for any areas that might cause problems for the motorhome and Explorer. There are several very long 8% grades, so we may choose to go around Boulder Mountain when possible if we're pulling the Explorer. The aspens haven't begun to leaf out except at the lowest elevations. That made the crossing like driving through a ghost forest of white-barked trees. After taking a short break in camp, we returned to the Scenic Drive to get a couple shots that Carol wanted. The lighting cooperated and there were some good clouds, so it was a good outing to the end of the Scenic Drive. This time we were able to finish where we ran out of light the day before. From the Scenic Drive road, we hustled to the turnout for The Castle on the main highway. I had never shot this feature in good sunset light, but this time we hit it perfectly. The lighting was warm and direct. The only improvement would have been a few clouds. From The Castle, we returned to Chimney Rock. When we stopped on the way back from Boulder Mountain, we had clouds but poor lighting. This time, we had great light. We ran all over trying to get the best pinyons in the foreground of the photos, but we only had about 20 minutes of good light before the shadows stretched too far in front of Chimney Rock.